Yoshitaka Amano Wallpaper: Kiss the fish! Minitokyo »	Yoshitaka Amano Wallpapers » Yoshitaka Amano Wallpaper: Kiss the fish! Love the vector and the background is really neat! Keep up the excellent work! ahahaha lol love the title, love the wall itself. Your thick-lined style looks awesome with Art Nouveau. How adorable! Wonderfully warm colours & a touch of Art Nouveau make what is otherwise a comical setting look sophisticated and classy. Lovely! This is beautiful! O_O The red looks so.. rich. Great job k1ru! Amano and Art nouveau looks good together. Kiru! This wallpaper is just gorgeous. The colors are vector are so lovely, great work! I liked how you worked on the scan and how the colors merge! It's gorgeous! Really lovely, I love art nouveau and don't have the guts to try to vector it. On top of that, you worked with Amano's art, which is soooo quirky, I love it. Great job.! 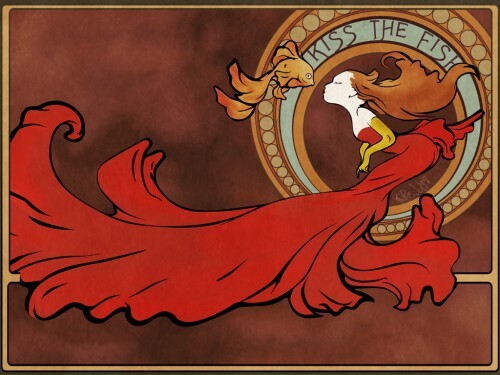 ah lady k1ru, you have made an Amano-san wallpaper in the art-noveau fashion. :) i love the overall composition especially the circular design. the original artwork comes from a book called "Kingyohime" (Princess Goldfish) and fashions the pretty princess with quasi-"cute" fish. this leads to my very minor crits: i think the fish would have been better served with a different color. i.e a light purple or a shade of blue etc., and you colored the dress part on her arms yellow- this is a mistake since the dress covers her whole body. so in essence the color must remain fixed. this is so wonderfully cute and interesting. it reminds me of so many stories that i have heard in my life. What if some one could get their wishes by kissing the fish?